It’s beginning to sound like a broken record, but some of the most interesting announcements at CES 2017 have been about gaming systems and components. PC gaming is back in a big way lately, particularly with the growth of PC-based VR systems, and a number of PC manufacturers are taking advantage of it. Now, we have word that custom PC company AVADirect is working hand in hand with component manufacturer Gigabyte on a new custom gaming PC that the companies are calling the “most advanced.” Given the list of components, we can see why the two companies are describing it in such glowing terms. At the core of the AVA Z270 Scorpio is Gigabyte’s new Aorus GA-Z270X-GAMING 7 motherboard, which leverages the overclocking capabilities of Intel seventh-generation Core i7-7700K processor. Gigabyte’s onboard TURBO B-Clock Tuning IC allows for fine-tuned clock rates to maximize performance, stability, and longevity. 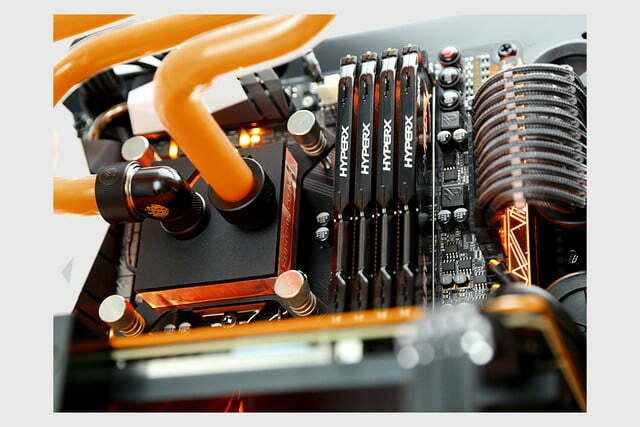 Other advantages of the Aorus GZ-Z270X-GAMING 7 motherboard include a host of connectivity options, including a total of six USB 3.0 ports, a USB 3.1 Type-A port, and a USB Type-C port with Thunderbolt 3. Dual RJ-45 Gigabit Ethernet ports provide for optimal networking, and an optical Digital Audio port provides for immersive surround sound. Finally, the motherboard provides two PCIe 3.0 x16 slots for dual GPUs running in SLI, along with M.2 and U.2 connections for high-performance solid-state drive (SSD) support. 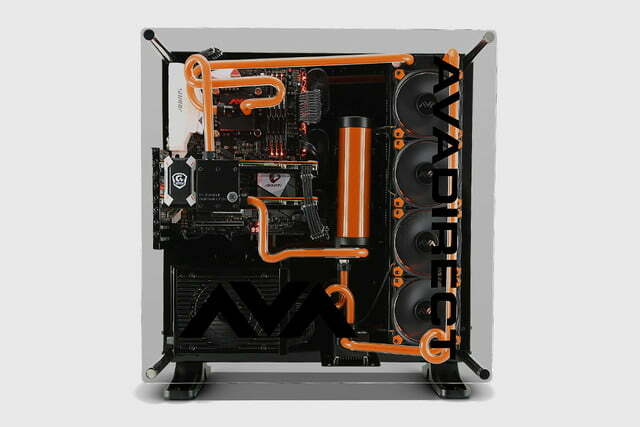 AVADirect’s primary contribution is their hardline liquid cooling system, that’s handcrafted by the company’s cooling experts. 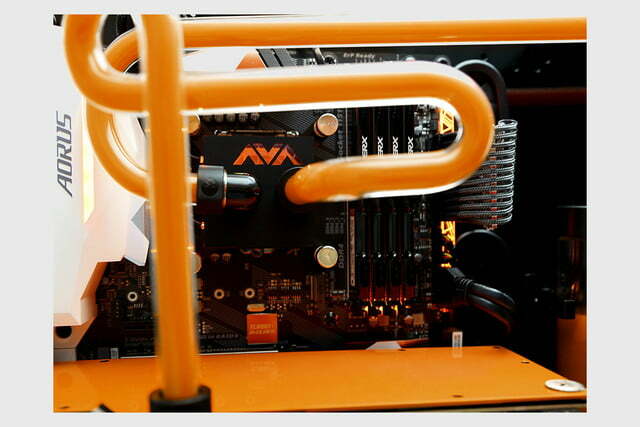 The bent rigid tubing and carefully tuned fans results is intended to provide superior cooling that allows the overclocking capabilities of Gigabyte’s motherboard to shine. More generally, the AVA Z270 Scorpio can be configured with the highest-end components, including Nvidia GeForce GTX 1080 FOUNDERS EDITION GPUs, up to 64GB of DDR4 RAM, and a host of high-speed and high-capacity SSD and hard disk drive (HDD) options. 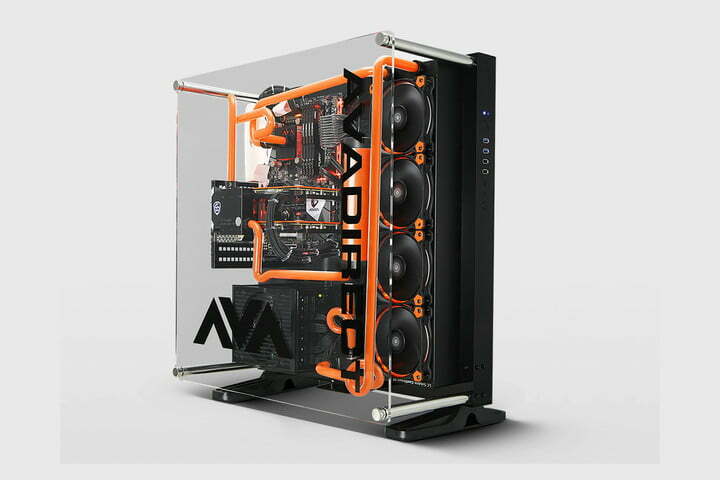 All of the components are assembled in a case that the company describes as having a “showroom quality appearance,” highlighted by a black chassis close off with a clear panel that shows off the PC’s interior. AVADirect is offering a configuration with Core i5-7600K quad core processor, GeForce GTX 1070 FOUNDERS EDITION, 16GB DDR4 RAM, and 128GB NVMe PCIe SSD, and a 1TB 7200RPM HDD for $4,929. Or, buyers can spend as much as they’d like in customizing their own machine. Regardless, AVADirect backs up each AVA Z270 Scorpio with a three-year limited warrant and lifetime technical support for the hardline liquid-cooled systems.